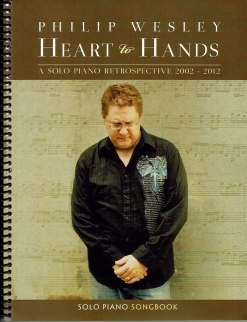 The Heart to Hands songbook is the companion sheet music collection to Philip Wesley’s 2012 retrospective recording by the same name. 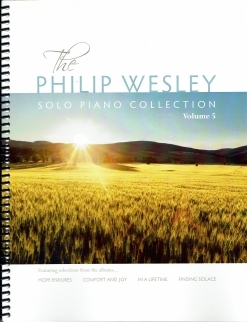 This is a collection of twelve piano solos from recordings that date from 2002-2012: Finding Solace (2), In a Lifetime (3), Dark Night of the Soul (4), Comfort and Joy (1), and Hope Endures (3). (In case you think I can’t count, “Lamentations of the Heart” is from two albums, although the version in this book is the one from Dark Night of the Soul). The book is spiral-bound and printed on a bright-white medium-weight paper. The covers are full-color reproductions of the CD cover artwork, and the notation is clear and easy to read. The pieces include metronome settings as well as plenty of expression and dynamics. Most of the pieces have pedaling suggestions and phrasing. None of the pieces are very difficult and a wide variety of moods are expressed in the music. 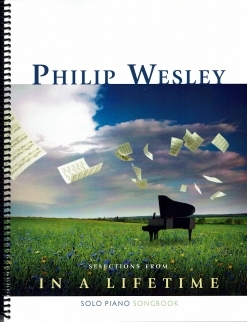 These are good teaching pieces as well as music for pianists who simply enjoy Philip Wesley’s music. A biography and discography are in the back of the book. 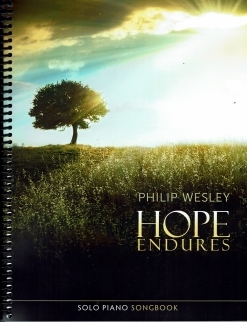 Wesley’s sheet music and songbooks are currently available exclusively from www.PhilipWesley.com. Recommended!